Never before has a trailer been so deserving of its name than Escapade’s ELITE trailer. Nor has a trailer ever been so well matched to its host motorcycle in both looks and performance. 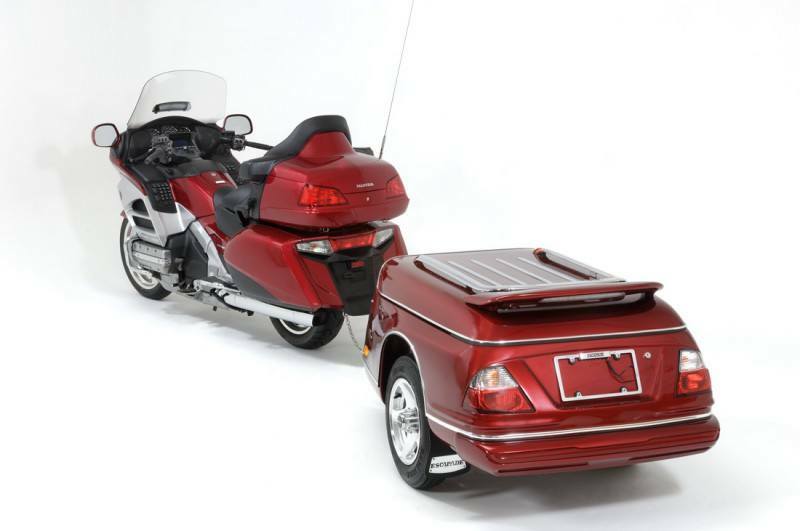 Designed specifically with the GL1800 Goldwing in mind, the result is a trailer that beautifully incorporates the sleek lines and style characteristics of the new Goldwing, while maintaining the unsurpassed quality and engineering for which Escapade is renowned. You’ll be amazed at the value you’ll receive with this trailer. A host of standard features and optional accessories, such as custom spoiler with brake light and lid-activated interior dome light, serve to make the Elite the finest example of craftsmanship and style on the road. Our bodies are hand made and custom finished at our factory. Our in-house fiberglass and paint departments insure the highest degree of quality control and the color match capability is unsurpassed. Bodies are painted using top of the line urethane paints and clears, with a 2-3 part paint process and 3 clear coats. For GL1800 colors, we use the same paints and clears supplied to Honda. Bodies are wet sanded and then polished in a two-step process to achieve an amazing paint finish. 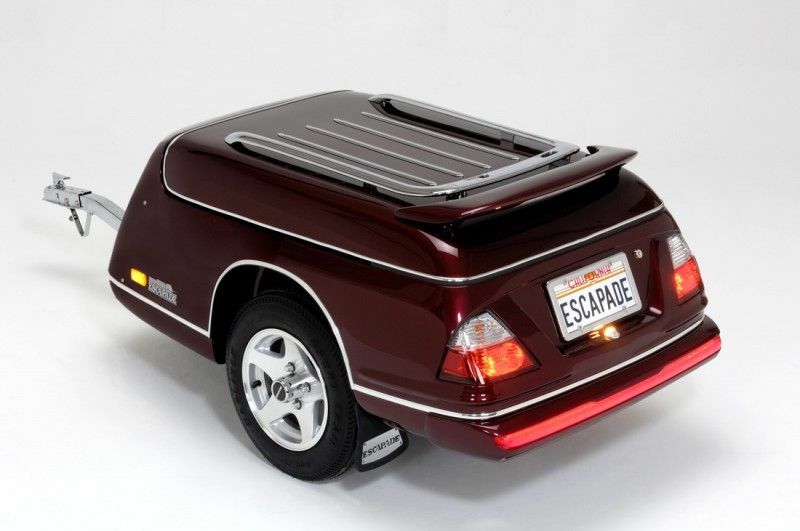 Escapade Trailer is the only manufacturer that combines the body and frame of the trailer to make a single unit. 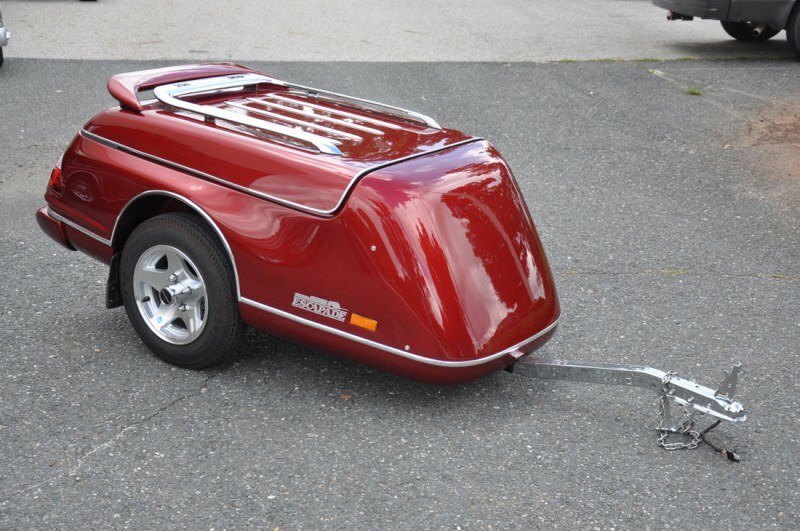 Our steel T-Chassis is integrated into the trailer body which lowers the trailer’s center of gravity and ensures stable performance in all riding situations. This gives the trailer a smooth, flat surface over which air can travel unobstructed and also creates longitudinal and latitudinal, greatly enhancing the cargo deck’s strength. Greater visibility means greater safety. Escapade Trailer exceeds the trailer light standards set by the United States Department of Transportation. All lighting is connected to the bike’s power supply with a substantial wiring harness that is firmly secured inside the trailer. There is no external wiring except at the tongue connection. For even more visibility, request the spoiler with L.E.D. brake light. Spaciousness that can’t be beat. With an Escapade you will get over 25 cu. 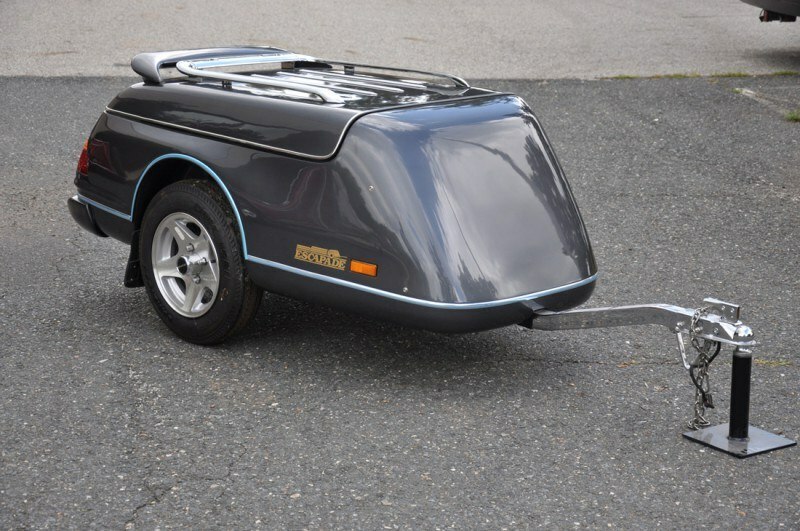 Ft of storage space, including an integrated spare tire compartment and utility storage areas that are designed to maintain a flat surface on the trailer deck (LE, SE and Elite models). 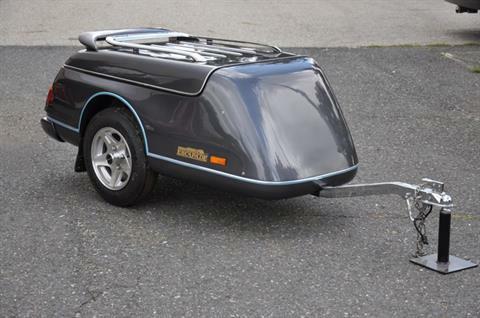 The Escapade Trailer’s legendary handling is the product of a brilliantly engineered suspension system. Our trailers incorporate an air shock system with an independent trailing swing arm design. The shocks have been designed for us by the industry leader - Progressive Suspension, Inc. The special damping cartridge gives superior damping even when the trailer is towed empty, meaning no bounce under every condition. These Progressive air shocks are used in all models except the Eclipse which uses a Progressive coil over spring shock.